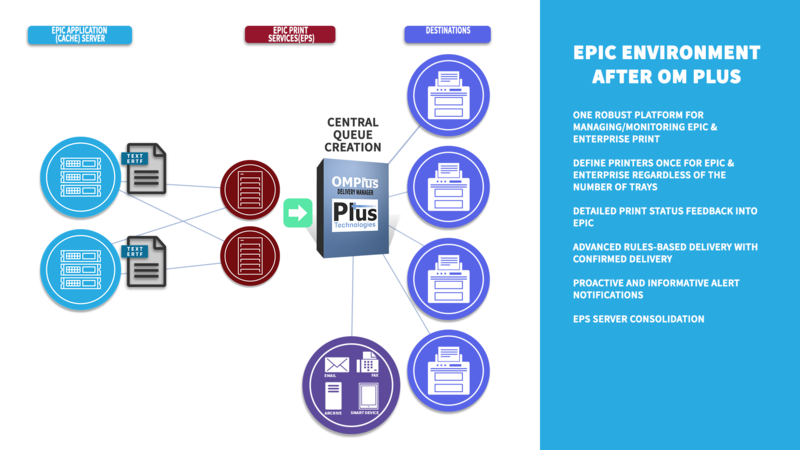 Plus Technologies has been providing Epic output management solutions (OMS) for over 10 years and have over 90,000+ Epic related printers licensed under our OM Plus Delivery Manager (DM) print software. We have implemented our OM Plus Epic OMS solutions in one of the largest nationwide Epic users and smaller regional users. We work closely with Epic to make sure our solutions work properly, are current, add functionality, scalability, and reliability. Our software is now available in the Epic App Orchard. In healthcare environments, fast, reliable printing is critical for business operations. Users need a powerful system that provides robust printing and is easy to implement and maintain. Our solutions provide a single platform for managing the enterprise print environment. They provide significantly more functionality which helps improve print operation efficiencies, so jobs print when and where they are supposed to. OM Plus Delivery Manager (DM) is the core building block of our solutions. It ingests data from many source systems and utilizes a rules-based engine to manage, monitor, and deliver jobs across complex LANs/WANs to many destinations and types. It provides a centralized administrative platform for the management and support of the print environment. Our solutions help eliminate the need for multiple staff, skill sets, and the collection of data from disparate systems, to troubleshoot print problems. They significantly reduce the time to create queues, architect print workflows and support printing, so users have more time to spend on patient care. Centralized management of print workflows across many systems and their segmented hops on the way to printers via ease-to-use, common interface. Define print queues once in OM Plus for Epic-enterprise backend and frontend printing. Relieves print delivery burden on EPS servers and other application and print servers. Replaces or enhances native Print management, monitoring and delivery process, all the way to printers’ output trays. 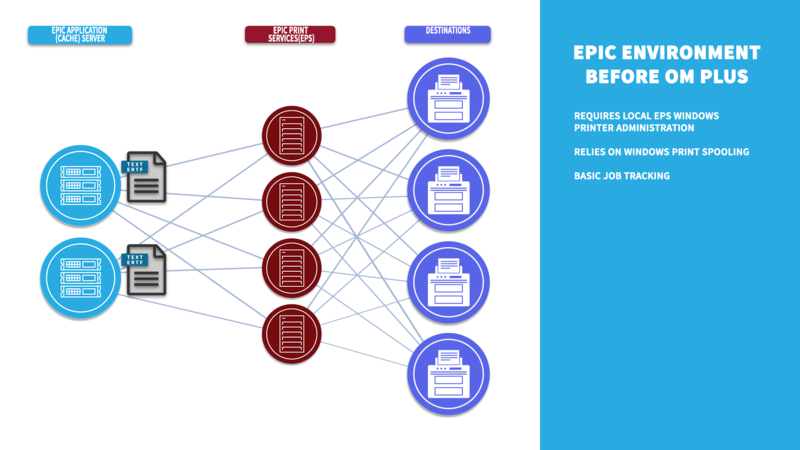 Provides detailed print job status back into Epic. EPS and Window print server consolidation. Advanced rules-based routing with confirmation of delivery. Job tracking, logging, diagnostic tools provide quick problem identification and resolution. Easily hold, redirect and/or restart print jobs, manually or automatically. Pro-active alert notifications with information about the who, what, when, where, title, printer errors, and more. My-Print-Delivery (MPD) – ‘user’ based print release with operational Imprivata print release authentication. Secure Queue Release (SQR) – ‘queue’ based print release with optional Imprivata print release authentication. Rx Print – Tamper resistant Rx printing utilizing electronic forms and plain paper. i-Sat – Secure cloud printing without the need for VPNs to small remote affiliate clinics for backend printing. Stats Manager (SM) – Collection/analysis of print usage information for security compliance and print fleet optimization. Provides a more Reliable, Scalable, and Secure print infrastructure that improves operational efficiency.